Verticillium wilt is a common soil-borne fungal pathogen that once it has infested soil can remain for a very long time. Verticillium wilt is caused by either Verticillium albo-atrium or Verticillium dahlia and has a wide host range (over 200 plant species). Both pathogens can survive (overwinter) as microsclerotia in the soil. Verticillium wilt prefers cooler weather and drier soils and can be more severe in neutral to alkaline soils. Solanaceous weeds such as Nightshade may harbor the pathogen. 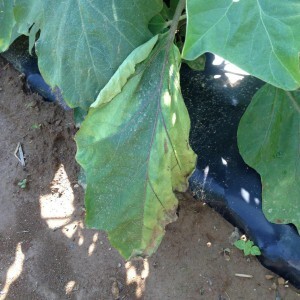 Symptoms can vary between hosts, but on eggplant the leaves of infected plants will typically become lopsided where one side of the leaf will wilt and stop expanding while the other side continues to develop. Vascular tissue near the soil line will become discolored. Eventually the entire plant will collapse as the vascular tissue becomes more infected (clogged) and water movement up the plant stops. There is no resistance to verticillium wilt in eggplant so long crop rotations with non-susceptible crops are critically important. Some cultivars, such as ‘Classic’ and ‘Epic’ may maintain yield in infested fields. For more information on verticillium wilt please see the 2015 Commercial Vegetable Production Recommendations Guide.